Winter is the perfect time to make soup. I won’t argue with that, although soup during any season with fine with me. They make a great appetizer or a main courses. They are relatively quick to make and are inexpensive. They are loaded with vitamins and minerals and are generally low in fat. And perhaps my favorite, they are comforting. Cooked tomatoes are loaded with lycopene, an antioxidant that has been shown to reduce your risk of heart disease, cancer and macular degeneration. Carrots have among the highest levels of beta-carotene available in a single food source. They also are loaded with vitamin C and potassium. Carrots are at their nutritional height value when lightly cooked because the outer fiber breaks down to enable easier nutrient absorption. Rutabagas (1 cup cooked) have only about 70 calories and 1 percent of the recommended daily allowance of sodium. They also are high in vitamin C, calcium, potassium, fiber and B vitamins. 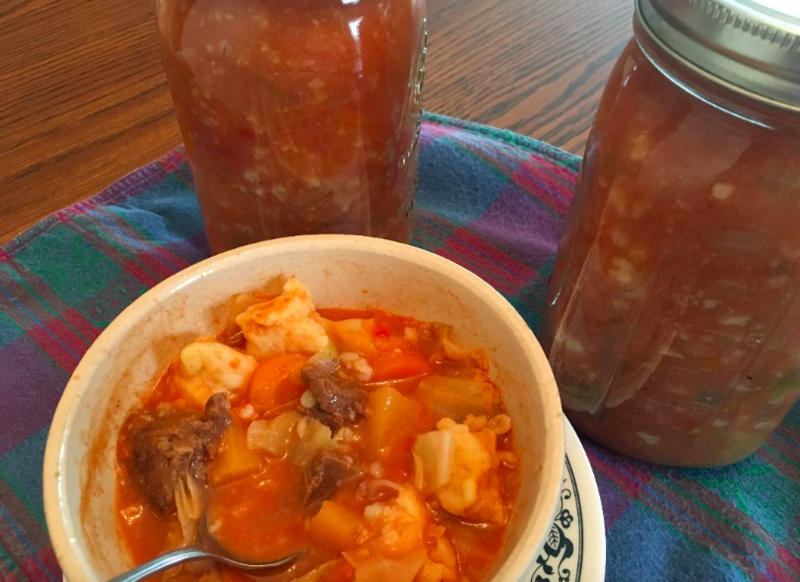 I got the hankering to fix the vegetable soup after being reminded on Facebook that “Uncle Hap’s (my Dad) soups were awesome” by my cousin, Marlene Tiedeman. But really, I didn’t really need much of a nudge. For soup: Cook meat in pot of water until tender. Remove and cut up into bite-size pieces if using roast. Set aside. Cut up vegetables and place in water along with tomato juice, meat and pearled barley. Heat to boiling. Reduce heat and simmer for 1 to 2 hours. For noodles: While soup is simmering, beat egg in a medium-sized bowl. Add flour, salt and water. Mix well until batter is a little stiff. Let stand for 15 minutes. Form into three or four strings and cut into bite-size bits. Once vegetables are cooked thoroughly, add cut-up dough mixture, one at a time. When finished, cook soup for about 10 minutes or until noodles are firm.